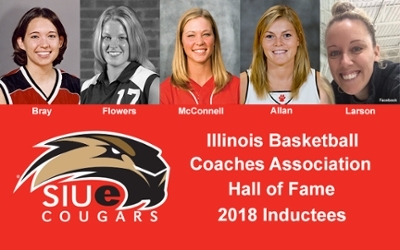 The DeShasier sisters will achieve a life milestone together as the three SIUE alumni will be inducted into the 2018 Illinois Basketball Coaches Association (IBCA) Hall of Fame, along with two fellow alums. The Carrollton natives include Stosha DeShasier Flowers, Liz DeShasier Bray and Alicia DeShasier McDonnell. Liz played SIUE Cougars Women’s Basketball from 1999-2003. She earned a bachelor’s in speech pathology and audiology from the School of Education, Health and Human Behavior (SEHHB) in 2003, and a master’s in speech language pathology in 2005. Stosha achieved a bachelor’s in business administration, with a specialization in finance, from the SIUE School of Business in 2001. She played one season for SIUE Cougars Volleyball in 2000. Alicia earned a bachelor’s in civil engineering from the School of Engineering in 2007. While at SIUE, she played SIUE Cougars Softball from 2003-06. She was a first team All-American softball player during her senior season in 2006. She threw javelin for SIUE Women’s Track & Field in 2007. Alicia was a 2011 Pan American games gold medalist. SIUE alumni Amber Shelton Allan, of Edwardsville, and Sarah Larson, of Galesburg, will also be inducted. Allan achieved a bachelor’s in physical education/teacher education from the SEHHB in 2009. She played two seasons of basketball for the Cougars and earned honorable mention All-American honors during the 2007-08 season. Larson earned a bachelor’s in psychology from the SEHHB, with a minor in criminal justice studies, in 2005. She also played two seasons of Cougars Women’s Basketball. Details on their athletics successes are available at SIUECougars.com. Hall of Fame induction details are available in The Alton Telegraph.